One of the elementary things that will make you feel lost is how to shop. Yes, welcome to the jungle. Well, dont worry, well give you some hints about the main shopping street in Iceland and the meaning of life in Iceland. That's as good a method as any to adapt to the local life. However, the living standard in Iceland is very high and yet even compared to European countries. According to Statistics Iceland and Eurostat the Icelandic per capita volume index at the level of Gross Product is among the highest in Europe, 29% over the EU25 average. Nevertheless, in countries where the GDP is high, the price level is high also, while countries with a low GDP have low price levels. At the prevailing exchange rate of the Icelandic currency in 2005 the relative price level was the highest in Europe, 44% over the average for the GDP as a whole. The high GDP in Iceland does not, however, account for the tremendous difference in the prices of food in Iceland compared to other countries. 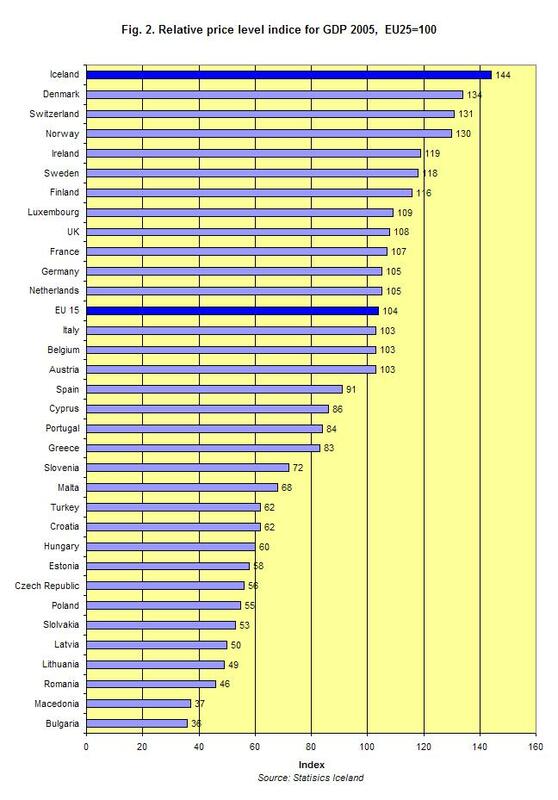 In Ireland it was only 19% over the average but the GDP in Ireland is higher than in Iceland, so the answer must be somewhere else! When you look at food and non-alcoholic beverages, which is 69% over the average, you will experience something of a shock, if you have planned to move to Iceland, that is. Living in Iceland is tough! 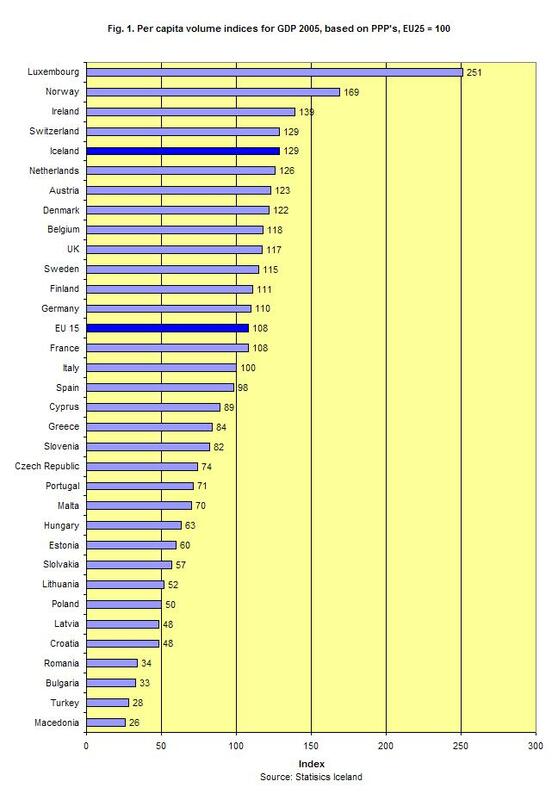 Luxembourg is clearly in a league of its own, as the GDP is 151% higher than the average. This is due to the fact that many people work and shop within its frontiers, while they live elsewhere and do not therefore count as its inhabitants. 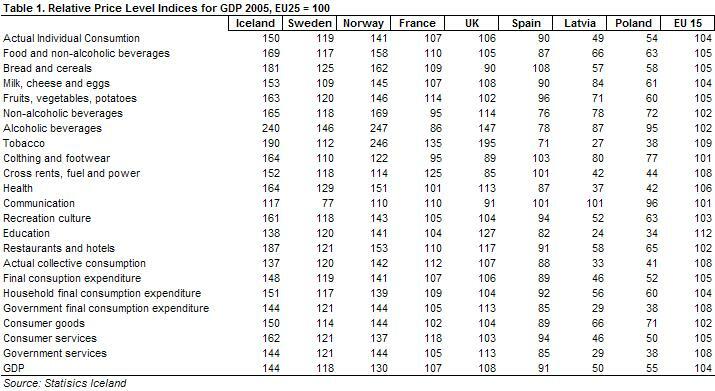 The GDP for Iceland is 129, and thus 29% higher than that of other EU-countries. Living in Iceland is high! The relative price level indices is the ratio between the PPP and the exchange rate. It is used to assess the different price levels of countries. 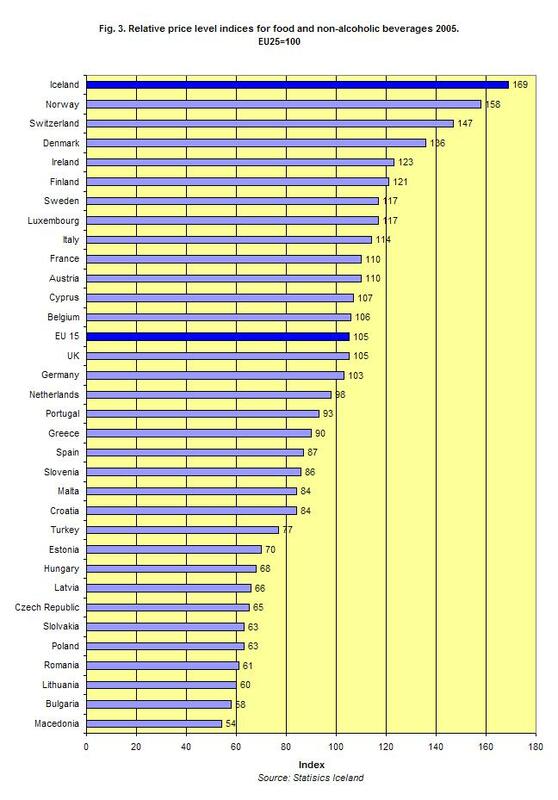 The indices of price ratios in EU-25, 100, show how many euros are needed as an average to buy the same amount of goods and services in different countries. The pro rata price indices does not show the PPP in each country, merely the PPP of the currency of each single country. The exchange rate of the ISK affects the results. The indices is 144 for Iceland. For products and services that cost 100 euros as an average in the EU in 2005, you have to pay 144 euros in Iceland. This is based on the ISK average exchange rate vs. euros in 2005. For foreigners, living in Iceland is a bit of a challenge if their income source is not Icelandic. There is no way to ignore the fact that food and beverage is astonishingly expensive in Iceland. It is prohibitively expensive to be a vegetarian in Iceland. This is indeed a mystery. Iceland is sitting on top with indices 169. There are three countries which have significantly higher indices for food and beverage price levels. These are Iceland, Norway and Switzerland. None of them are in the EU! For those of you who use alcoholic beverages, don't forget to buy as much as you are allowed to in the tax-free shop at the airport terminal when you arrive, as the price in the state monopoly is, once again, prohibitive.